There was a time when I thought all activities needed to be a group project. You know what I mean – Lary and I do them together. Ahh, the bliss of couple life. What I began to realize is that when one of us doesn’t really want to participate, the bliss can become misery for all involved. Law four and five should have been utilized and we would have all been happier. We’ve been discussing the “Ten Laws of Boundaries” in Boundaries In Marriage by Drs. Henry Cloud and John Townsend these last few weeks and today we touch on three more. As I thought more about this, I am reminded of Christ’s love for us. He wants us to choose to love, to choose to be in a relationship with Him. God is such a gentleman. He respects our right to choose, even when He knows He won’t like the answer. It is His will that no one dies without a relationship with Him. The cross and the empty tomb are testaments to His desire for us to be with Him forever. He made a way. Such love. Law # 5 The Law of Motivation – “states that we must be free to say no before we can wholeheartedly say yes. Having to do anything is a sign that someone is afraid.” What are some of those fears? The Drs. list eight fears in total. As I read over these, I see my motivation for many yeses in my life were founded in fear. No one wants someone to say yes to us because of fear. Did Lary say yes to me for some of those blissful activities because of concern or fear over how I would react? As I begin to understand boundaries better, I see where fear definitely motivated my yes too many times with him. He wouldn’t want that and I don’t either. Law # 6 The Law of Evaluation – This one really hits me hard. I am a fixer and I do not want anyone I love to be in pain. This law asks us to do an evaluation, “We need to evaluate the pain our boundaries cause others. Do they cause pain that leads to injury? Or do they cause pain that leads to growth?” This reminds me of something Beth Moore once said, “Just because something is hard doesn’t mean it’s wrong and just because it’s easy doesn’t mean it’s right.” The Docs say it like this, “Just because someone is in pain doesn’t necessarily mean something bad is happening. Something good might be going on, such as a spouse learning to grow up.” The book goes into much detail with examples – another good reason to read it. I watched a show last night (documentary) letting me be that proverbial “fly on the wall” in a family that was in a serious financial situation. Husband, “She has to stop spending so much money (wife had grown accustomed to lots of disposable income to spend). If she doesn’t I am going to reduce her credit card limit.” He did not and she did not stop. This is a great example of when pain leads to growth. That action would have hurt but would have been a great decision for the family. Boundaries in any relationship can be uncomfortable. Downright painful – even for the one setting them. Gil Martin, our counselor, once told me that a boundary can look like an “I don’t love you.” to someone. That’s not how we feel, but that might be how they perceive it. Hopefully, those issues can be worked through when both parties want to be healthy. If we could just learn how to love and respect like Jesus, our relationships would be so much healthier. He set the original boundary lines for relationships. Haha! So true Beth. What is the old saying, “no pain, no gain”? I love the “Boundaries” books – full of such helpful information. I know that learning to set up healthy boundaries in my own life has been such an important part of my healing journey. Kamea they certainly are good books. I appreciate these men for their willingness to tackle a tough subject. Setting boundaries is definitely a part of the healing road. We do serve an amazing God. His relationship advice is spot on isn’t it? My hubby and I just attended a marriage conference last weekend. Your post is perfect timing as all of this is fresh on my mind. Thank you for sharing. Such a blessing Christy to attend a marriage conference. Those times away together sure help strengthen us. That motivational yes from fear… relating to that one big time. I’m so enjoying hearing your take on this book step by step, Carmen, I would never begin considering it myself without reading your honest take on it all, invaluable really. Hello Christine, yep that point hits me too. I have had that motivation too many times. I’m sure glad you are enjoying my thoughts on the book. It is a worthy addition to all married couple’s libraries. Yeah Crystal, that point is a hard one. I just want it to be what makes me comfortable. I’m glad the Holy Spirit shined a little light on that statement for you. Especially if it helps you guys resolve a question. Blessed to link with you friend. I’m glad to realize you’re doing this series on Mondays. I read the book years ago, but need to be reading it again. Setting boundaries is such an unnatural relational skill for me and I pay the price in too many ways. Sweet friend, there is much overlap in our lives. Wouldn’t it be lovely to be able to meet for coffee in person? I would for us to meet Ginger! That would be so much fun. Girl, setting boundaries is one of my weaknesses. Well, actually setting them works well, maintaining them is where the trouble comes in! Great words of wisdom! Thanks so much for sharing. Hello Celi, glad you stopped by. Good points Lisa. It’s nice to meet you! This sounds like such a great book! I love it when those two team up together and I am sure this book would be helpful for any marriage! Great post! Karrilee it is a great book. Those two docs have invested many years into marriages. Any why haven’t I purchased this book yet?! You do it such justice, Carmen. I hang on every post, excited to dig in and learn more about its marriage-changing potential. Now, to get the book and put its wisdom (God’s really) to work. Thank you for posting this series. Visiting via both #IntentionalTuesday and #RaRaLinkup. Oh Kristi, the book is really good. If you are like me and can tend to move those boundary lines, it will help you so much. Glad you visited friend. 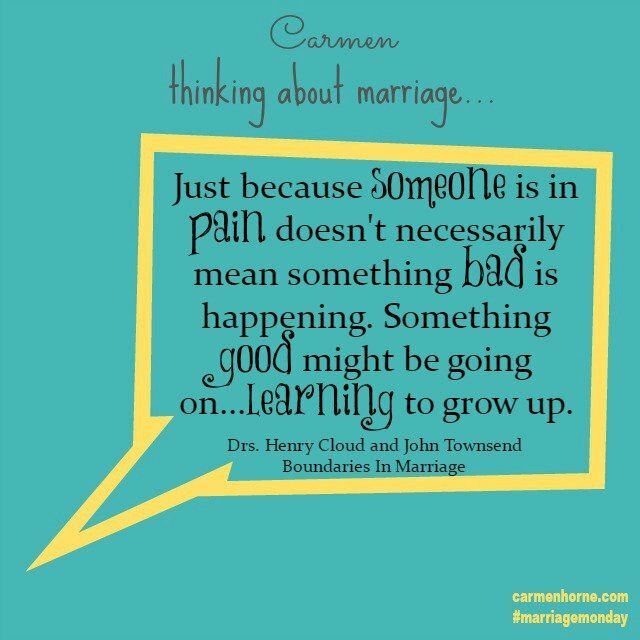 Love your marriage Mondays, Carmen! I really appreciate the point that we don’t HAVE to do EVERYTHING together. I think sometimes society and our own expectations impose a false view of what a healthy marriage is: doing everything together to show how happy we are, right? My husband and I have found it far more satisfying to do m any things together, but also have a few activities we enjoy independently. Love that Law # 4! I agree Betsy. I struggled with that need for so long. Hopefully we both now know that we are free to say no. Of course, we all do things we aren’t just jumping at for those we love but after 36 years of marriage, I think I have figured out what’s an ok no. Blessings friend.